Secretariat Festival | Paris, KY festival celebrating 1973 Triple Crown winner Secretariat and the local bluegrass heritage. 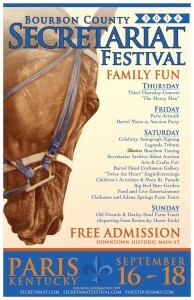 Paris, KY festival celebrating 1973 Triple Crown winner Secretariat and the local bluegrass heritage. Don’t miss this spectacular celebration – it’s great fun for the entire family! 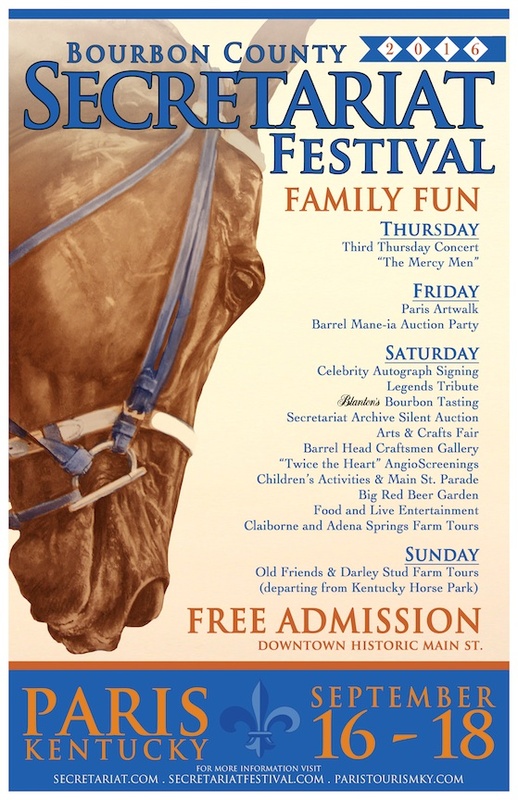 The Bourbon County Secretariat Festival, which celebrates the life and legacy of the 1973 Triple Crown champion, is set for Sept. 16-18 in Paris, Ky. For its ninth renewal this year, the Festival is moving its epicenter to Main Street in Paris’ historic downtown with excursions to nearby farms and will again draw Thoroughbred racing royalty home to the Bluegrass to meet with fans as well as showcase the region’s culture and character. Thursday, Sept. 15 The “Third Thursday” Concert at the Bourbon County Courthouse features live entertainment from “The Mercy Men,” beginning at 5 p.m.
Friday, Sept. 16 The Paris Artwalk officially kicks off the Secretariat Festival on Friday at 5 p.m. with more than 30 shops and venues along Main Street participating in this popular civic event, which showcases more than 100 local and regional artists. In the heart of downtown, Oasis Event Hall, 610 Main St., serves as theSecretariat Festival Headquarters and information center, where visitors will find the Secretariat.com Store and official Festival merchandise. This historic location is also the backdrop for theSecretariat Archive Silent Auction and all celebrity signings throughout the weekend. At 8 p.m., Oasis also hosts the Barrel Mane-ia Auction Party. The Festival’s signature Friday evening event features the live auction of original Kentucky oak barrels hand-painted by regional artists reflecting the unique equine culture of the area. The character of the exposed brick and wooden floor interior provides the ideal setting to preview these creatively embellished whiskey barrels, each with its own individual theme, artist and medium. This evening of live entertainment and Kentucky-style fun will also offer a cash bar featuring Festival sponsor Blanton’s Bourbon, the original single-barrel bourbon. Saturday, Sept. 17 The Festival hits full stride with fans and families who travel from far and wide across the country to gather together to celebrate Secretariat’s legacy. Visitors to the Festival’s Main Street corridor can expect a thrilling buzz of excitement with a variety of attractions for all ages. The Festival’s Horse Farm Tours start at 9:30 a.m. and continue throughout the day to offer guests an insider’s view into Kentucky’s Thoroughbred breeding industry. For those who wish to explore the roots of Secretariat, Claiborne Farm tours provide visitors a behind-the-scenes look at the prominent Thoroughbred breeding operation, now in its fourth generation of ownership by the Hancock Family, where Secretariat was conceived and rests in his hallowed grave site. Also featured are two tours of Adena Springs, the esteemed Bourbon County farm that is home to an impressive roster of distinguished stallions including four Breeders’ Cup Classic champions and the 2013 Secretariat Vox Populi Award winner, Mucho Macho Man. Horse farm tickets can be purchased in advance at Secretariat.com and at the Oasis Secretariat Store while quantities last. A new Festival addition this year has all the marks of evolving into a longtime Festival tradition. The Secretariat Big Red Beer Garden is the exclusive source for Secretariat Festival Big Red Amber Ale. Brewed and bottled in Paris, Ky., by the popular Rooster Brew, 609 Main St. directly across from Oasis Events, this new craft brew created specifically for the Festival pays tribute to Secretariat and his larger-than-life legacy with a big flavored Bluegrass-born beer. This limitedbatch ale is offered in sure-to-be collectible run for drinking or displaying, and the beer garden is a must-stop to raise a toast to the chestnut champ. Contact Rooster Brew for more information. The Festival’s Legends Tribute Appearances offer guests a rare opportunity to meet with racing giants and hear their stories firsthand through truly memorable visits and discussions. The lineup for this year starts with The Wise Dan Legends Tribute. Guests can meet the beloved equine athlete and his devoted trainer Charles Lopresti on Saturday at the Bourbon County Fairgrounds, only minutes from downtown. Free visits with Wise Dan will be held from 12:30 to 2:30 p.m. with a complimentary shuttle bus service running between Main Street and the Fairgrounds. This modern day chestnut champion, who fittingly descends from Secretariat on both sides of his pedigree, was the poster boy for durability, perseverance and success in a career that spanned 31 starts over five years and culminated with 23 victories on both dirt and turf. The second Legends Tribute of the day spotlights Sham and his Hall of Fame jockey Laffit Pincay Jr. Most Big Red fans are familiar with Secretariat’s brilliant rival Sham who finished second to the Meadow Stable champ in both the Kentucky Derby and the Preakness Stakes, unofficially breaking the previous track record in both races. Secretariat Festival fans will have the chance to learn much more about this brave and talented horse when his Hall of Fame jockey Laffit Pincay Jr. joins Phil Dandrea, author of Sham: Great was Second Best, in an in-depth discussion of this noble competitor. All guests are welcome to attend this free discussion and book signing at Oasis Events from 2:45 to 4 p.m. The Secretariat Archive Silent Auction continues throughout Saturday, 9 a.m. until 4:30 p.m., at Oasis Events. The ultimate destination for racing memorabilia and sports collectors, the silent auction features a variety of authentic racing artifacts from the Secretariat and Claiborne Farm archival collections. This year’s auction offers original halters and horseshoes from some of the industry’s most popular stallions as well as a unique assortment of Secretariat and racing-related memorabilia and artwork. Additionally, history will come alive with a special display of the authentic 1973 Preakness winner’s garland that Secretariat wore following his victory in the second jewel of the Triple Crown. This museum-quality piece is an original artifact from the collection of Secretariat’s owner Mrs. Penny Chenery, and Festival guests will have the opportunity to view it before it is offered for sale in October to benefit the equine charity R.A.C.E. Fund. The Secretariat Festival Saturday Signings feature celebrity appearances and autograph sessions to rival the First Saturday in May. This marquee event, boasting members of the Meadow Stable team, Hall of Fame jockeys, and other racing luminaries, has become a dream destination for autograph seekers of all ages. Celebrities confirmed to date include Secretariat’s Hall of Fame jockey Ron Turcotte, exercise rider Charlie Davis, author and journalist Bill Nack, and Kentucky Derby winning jockeys Laffit Pincay Jr., Jean Cruguet, Pat Day, Mike Manganello, and Jacinto Vasquez. Others may be added to the schedule, and an updated list of confirmed guests and signing times at the Oasis will be announced in early September. A variety of children’s activities will be offered along Main Street, including face painting, inflatables, Euro aerial bungee as well as unique interactive exhibits such as Horse of a Different Color and the “Pony Express” Equicizer, one of the Festival’s most popular attractions. For youngsters and adults alike, the Equicizer’s mechanical horses, used by professional jockeys across the globe in training to refine their technique, allow burgeoning riders and equestrians of all ages to ride like a pro. Receive personal instruction, pointers and tips from some of Thoroughbred racing’s finest, including the Festival’s visiting celebrity jockeys. This familyfriendly activity is scheduled from noon until 4 p.m. at Hope Park on Main Street. The Barrel Head Craftsmen Furnishing Gallery, sponsored by Lexington Furniture, is a unique assortment of decorative furnishings creatively derived from original and authentic oak whiskey barrels representing some of the world’s finest distilleries as well as the most talented Bluegrassborn craftsmen. Guests can take a little bit of Bourbon County home with them from this diverse selection of rustic to refined offerings. Located at 423 Main St., directly across from the tented vendors. “Twice the Heart” AngioScreenings, sponsored by Bourbon Community Hospital, offer affordable, quick and easy private screenings to determine risk for heart attack and stroke. Screenings take place at 530 Main St. between 9 a.m. and 4 p.m. The Secretariat “Horsepower” Festival Parade, sponsored by Dan Cummins Chevrolet Buick, showcases the Paris community at its heart — down charming Main Street. Featuring marching bands, dancers, floats, new Corvettes and vintage autos, as well as a variety of equine breeds and entertainment, including the Kentucky Mounted Patrol and Renegade Cowgirl Drill Team. And parade-goers are invited to get in on the fun, dressing in 1970s apparel or as Meadow Stable look-alikes with prizes awarded for the best Penny and other members of the Secretariat team. The parade starts at 5 p.m. at the 10th Street intersection and runs to the Courthouse. Immediately following the Parade, the Secretariat Festival, in partnership with Blanton’s Bourbon, is proud to host the Blanton’s Bourbon Tasting and Bill Nack Storytelling. This Bluegrass-inspired evening celebrates smooth bourbon, fine food and horse talk at the chic Bour-Bon Restaurant, 616 Main St. The evening starts at 6 p.m. with a bourbon connoisseur’s dream tasting of Blanton’s Bourbon led by bourbon expert and retired master distiller Dave Scheurich. At 7 p.m., enjoy a sumptuous Bluegrass-inspired menu of hearty hors d’oeuvres representing the flavorful history of the region’s cuisine. Then at 8 p.m., renowned sports journalist Bill Nack, author of the best-seller Secretariat: The Making of a Champion, which served as the inspiration for the hit Disney film Secretariat, leads a unique presentation providing an insider’s perspective to the champion’s life and legacy. Joining the acclaimed writer will be special guest Richard Laurin, grandson of Meadow Stable’s legendary trainer Lucien Lauren. Both of these distinguished Festival attendees will share their favorite stories and personal recollections of Secretariat and engage in a Q & A session with the audience. Live entertainment and cash bar will follow to cap off this memorable evening. Tickets for this event are available at Secretariat.com. Please Note: Tickets will now be $50 per person to make this memorable event affordable and accessible to more Festival-goers. This reduction is in keeping with the Festival’s community mindedness and accommodation for all horse racing fans. Sunday, Sept.18 Beginning at 9 a.m., the Festival will offer satellite experiences starting from the Kentucky Horse Park in Lexington, where Secretariat’s Triple Crown trophies and life-sized bronze sculpture are located. The Old Friends/Darley Stud Tour combines the experiences of the non-profit equine retirement facility Old Friends, where visitors can see Secretariat’s most accomplished living son Tinners Way as well as Kentucky Derby winners Silver Charm and War Emblem, with the illustrious Darley Stud, home to many acclaimed stallions including Bernardini, Medaglia D’oro, and Kentucky Derby winners Animal Kingdom and Street Sense. The double-tour will depart by motor coach from the Kentucky Horse Park at 9:15 a.m. on Sunday and will return to the Kentucky Horse Park at approximately 1:15 p.m. Tickets for the tour are available at Secretariat.com. The Ashford Stud Tour is the grand finale of the Secretariat Festival with a rare and very special opportunity for ticketed guests to visit Ashford Stud, home of 2015 Triple Crown and Secretariat Vox Populi Award winner American Pharoah. This tour is sold out; however, a pair of tickets for this highly sought-after opportunity will be offered in the Festival silent auction. Tickets for the Festival’s premier events can be purchased at Secretariat.com; look for the 2016 Festival information under the Fan Club tab and Upcoming Events page. City Lot at the intersection of 8th and Main streets, running to High Street. Festival updates can be found on the Secretariat Festival’s Facebook, Instagram and Twitter feeds.